Tony Turner once commented, “If you want litters, have puppies or pigs, and if you want to feed out a lot of grain, raise hogs.” Two good reasons for Cluns: they frequently have two lambs, and they generally raise them on pasture without grain. 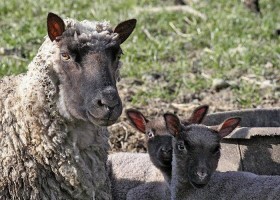 My pasture-run seven-month-old lambs average 36 to 42 pounds hanging weight­ just what my freezer trade likes. I also retail lamb by the cut at the local farmer’s market to an intelligent and hip clientele. We know with pride they’re getting what they want­ which is lean, succulent lamb, not fat. A good example of this fat issue was driven home to me a number of years ago. At the time, I was going around to some of the local agricultural fairs giving sheepdog demonstrations and selling lamb (mutton) shishkebobs and sausage. I did this primarily to utilize my own culls more economically, but I also was trying to introduce lamb to the many, many rural people that have never tasted it. Well, business had been brisk and with a large event coming up, I realized that I had no more ewes to cull. So, I called around and bought some ewes, five Hampshires from one farmer and five Cluns from a fellow breeder. My son and I butchered them as we normally did, knowing just what we wanted ­roughly half cubed for skewers and half ground for sausage. The dogs got the bones except the fat. And this is the killer: from the five Cluns we had a medium-sized mixing bowl of fat, and from the five Hampshires we had two five-gallon buckets full! Surprisingly, there wasn’t much more meat from the Hampshires. The best quality of Cluns, however, is their mothering ability and ease of lambing. Those narrow little heads just slide out and the ewe most often starts pawing them up to nurse before the little buggers have even gotten their breath. The lambs also are keen and ready to get right on with it. At sub-zero temperatures that frequently occur during lambing, this means something. I don’t think that a lot of the people today that have off-farm jobs are prepared to stay up all night in the lambing barn and then go off to work in the morning. Personally, I turn off the barn lights at 9:30 and don’t go back until dawn. I’m not saying that there are never going to be problems, but, in general, the Cluns take care of themselves. I think we have to ask ourselves just what do we really need in a breed. 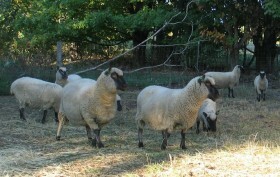 The popular breeds today, and not just sheep breeds, have been chosen primarily for just one characteristic: production. Quantity has replaced quality repeatedly. We have gigantic, grain-stuffed sheep, absurd volumes of inferior tasting milk, eggs, and meat, and fruit and vegetables that last forever, but are absolutely tasteless. Production has become the bottom line. It’s time now to consider the whole animal and the whole environment. It’s time to begin looking at health, longevity, vitality, hardiness, and adaptability. This doesn’t mean we disregard efficiency or economics, but it does mean a more sober evaluation of total energy utilization, a more sensitive ecological awareness, and a more frugal and humane approach to agriculture.